If you own a laptop and do a lot of work on it when sitting on the couch or in bed you will be interested in the Work EZ Executive Model improves your posture while computing and reading to decrease back neck, and shoulder pain increases focus, energy, and comfort. Works with laptops, monitors, tablets, and books; has a built-in fan which cools during use, simple set up, and reduce glare. Executive raises your laptop/tablet off your lap, keeping it cool and adjusts so you don't have to crane your neck to see the screen clearly. 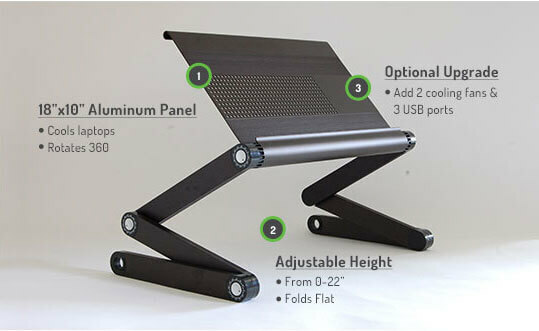 3-Section legs form a stable base; panel rotates to put screens at the perfect angle. Turn any desk or table into a simple Laptop Standing Desk, and extends up to 22" allowing you to raise your laptop off your lap and the screen to the perfect height. Stretch your legs move around and get comfortable, 3-section legs are stable on the couch, collapsible, lightweight, and foldable. My Opinion: This is a great stand which I used for my laptop so I can work in bed, not just at a desk. It is easy to put together and very light-weight.